It is nice to see that instant photography is far from dead. Now, it has even gone digital! Canon is adding two cameras to its portable printer lineup: the IVY CLIQ and IVY CLIQ+. 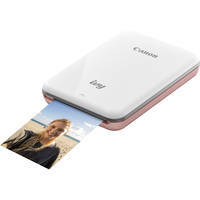 These instant camera printers, as Canon calls them, can snap digital pictures and then produce fun 2 x 3" prints on the spot. Being super portable, easy-to-use, and colorful makes them a great addition to your everyday carry or travel kits. Part of the beauty of the IVY CLIQ is that it can find a home in anyone’s hands, from a young child to a 20-something’s wedding, and even an adult who wants to snap and share photos with their friends and reminisce about the days when Polaroid film reigned supreme. The CLIQ is the base model, and operates just like a classic instant film camera would. You snap the photo and, then, a 2 x 2" or 2 x 3" photo pops out. The ZINK paper used even has an adhesive backing so every image you print is a sticker you can put up nearly anywhere. Being digital means that it will save the 5MP images to an optional microSD card if you want to share them later to social media. Each pack of ZINK paper holds 10 sheets and the built-in USB-rechargeable battery pack is good for about 25 prints on each charge. The CLIQ also has a reprint button—which is great if you want to share the photo with a group—along with a selfie mirror and an optical viewfinder. It comes with a wrist strap for easier carry, too. 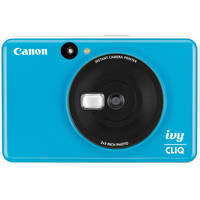 As for the colors, the IVY CLIQ Instant Camera Printer comes in Bumblebee Yellow, Seaside Blue, and Ladybug Red. If you want something with a few more features, the IVY CLIQ+ sounds like it might be the right choice for you. As a camera, the CLIQ+ upgrades to an 8MP sensor for higher-resolution images, gives shooters a bigger selfie mirror with guidelines for framing up perfect portraits, has an LED ringlight, and adds Bluetooth connectivity. The addition of wireless is the big trick here, because it gives it similar functionality to the IVY Printer since it adds support for the Canon Mini Print app. This app allows the CLIQ+ to function as a mobile printer and, through the app, you can choose and select images on your mobile device to print. There are also filters, frames, and text options for adding a bit more to your prints. Other abilities of the app are customization of the on/off and shutter sounds by recording your own, as well as the ability to trigger the shutter remotely. If you want a camera and a mobile printer, the CLIQ+ is where it’s at. This one also comes in fun colors with Pearl White, Sapphire Blue, and Ruby Red. 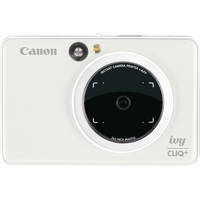 Hybrid digital cameras and instant printers are a fun new trend in the photo world. Are you a fan of modern-day instant photography, or would you rather go back to film? Be sure to let us know your thoughts in the Comments section, below!